The Thames Sailing Barge Trust is a registered charity that exists to preserve two Thames barges in sailing condition and in 2018 TSBT celebrates its 70th year of operation. 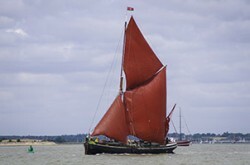 The Trust aims to improve the understanding of the public as to the historic and cultural role of Thames Sailing Barges in the heritage of Great Britain and to promote and teach the practice and the traditions and skills of seamanship involved in the handling and maintaining of these craft by taking people sailing in the waters traditionally sailed by these craft. The Thames Sailing Barge was the main form of bulk cargo transport on the East Coast for over two hundred years. The Thames Sailing Barge Trust (TSBT) sails and maintains two of these traditional craft, s.b. PUDGE and s.b. CENTAUR. Both sailing barges are sprit-sail rigged with a sail area of around 3,000 square feet and both carry auxiliary diesel engines. Following their days in trade they have had the cargo hold converted for carrying people with a comfortable saloon and galley with sleeping accommodation in two and four berth cabins. Both barges can be chartered from May to October for groups of up to a maximum of 12.